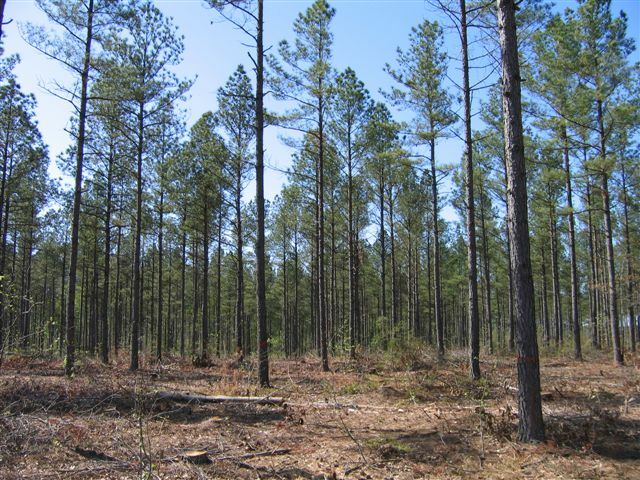 Planted Loblolly pine stands are generally ready to be thinned for the first time between the ages of 14-17. 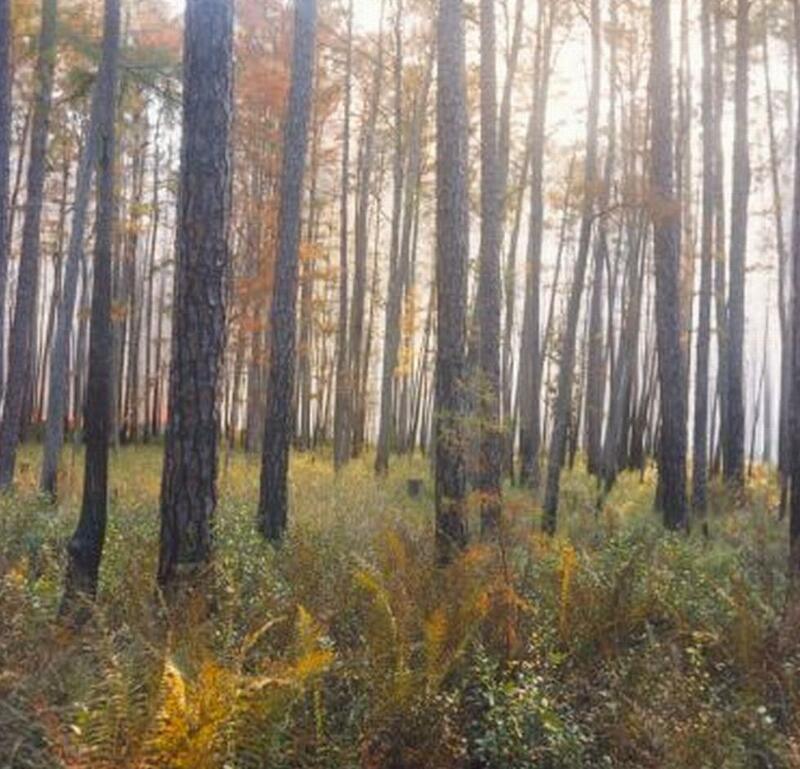 Natural stands of Loblolly pine may be ready then as well, however, due to excessive natural regeneration, they are usually ready for a thinning a little later between 17 and 20 years of age. 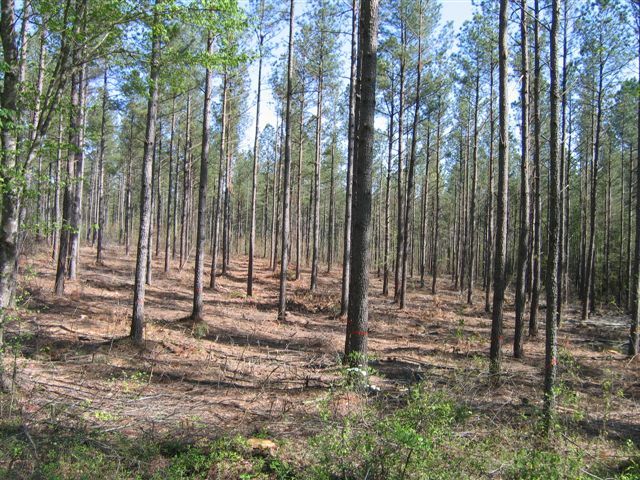 Thinning is perhaps the single, most important silvicultural tool that one can employ to significantly improve one's pine forest. Thinning greatly increases the growth rates of the residual trees by removal of the smallest, diseased, and defective trees that are currently competing with the better trees for sunlight, moisture and nutrients. Removing the undesirable trees gives the residual trees more "room to grow." No longer under stress the residuals are far less susceptible to attacks by Southern Pine Bark Beetles. More sunlight reaches the forest floor after thinnings allowing for abundant vegetative growth increasing the supply of food & cover for all types of wildlife. Last, but not least, thinning is an income producing venture for the landowner! 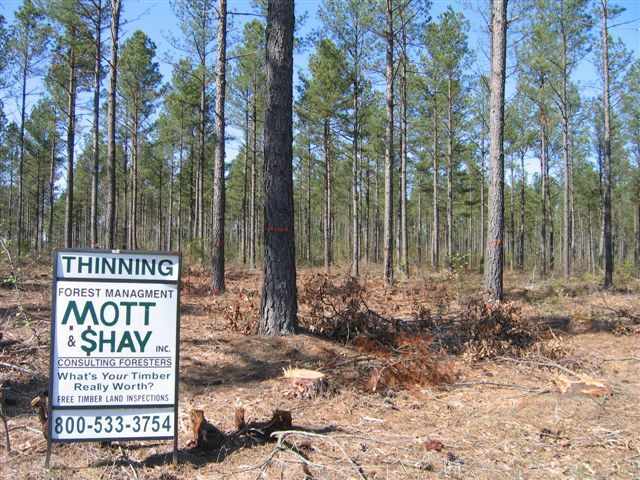 MOTT & SHAY, PLLC, CONSULTING FORESTERS has helped hundreds of landowners like you conduct highly effective and profitable thinnings on thousands of acres across North Carolina & Virginia. Here's what we do: We identify the areas that need thinning and delineate them on the ground. 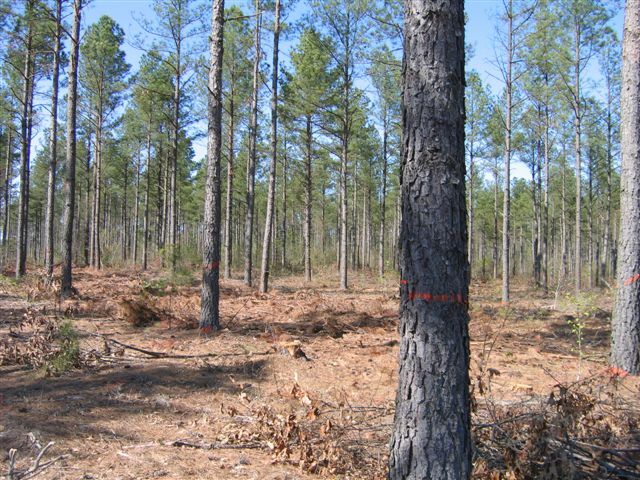 We then advertise your thinning for "sealed-bids" requiring the bidders to state what "price-per-ton" they will pay for pine pulpwood, hardwood pulpwood, etc. We help you to decide the best bid to accept, not only based on prices but also based on who does the best work. We assist with the closing and require the buyer to make a deposit on the thinning. Once the thinning begins we monitor the thinning operation very closely making certain they adhere to the contract. We provide copies of the scaling tickets & settlement sheets along with payments each week that the thinning is in progress and make sure the loggers cleanup behind them and leave your forest neat. Remember also that if the thinning is not being performed as per agreement the landowner and/or Mott & Shay reserves the right to cease the thinning operation at any time. That event is extremely rare since we try to get you the best thinners in the business and look after your thinning as if it were our own. A second thinning may be in order 6-8 years following the first thinning. Due to the fact that the trees left after the second thinning are to be your final crop trees special care must be made in the selection of the "leave-trees" and the thinning crew. Whether it's your first or second thinning let Mott & Shay help you to get achieve the best results!